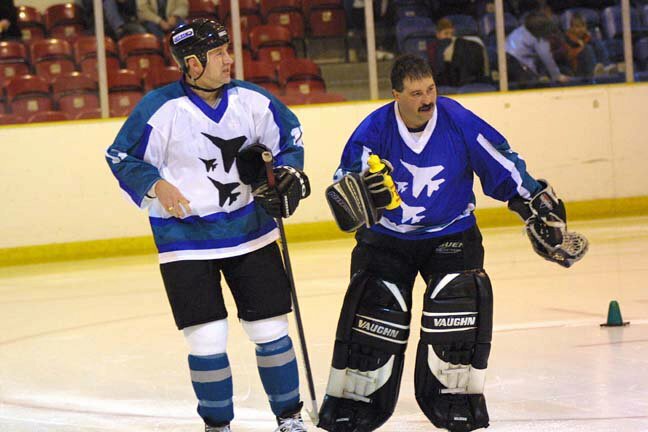 Gary Stefan, Craig Moran, Tammy Moran and Mark Denholm are now in the process of arranging a day of celebration which will start at Absolutely Ice with legends that have represented the Jets in their 28 years making up two teams and playing an exhibition match. As well as the on ice action we will have fun around the rink to get involved in including a raffle and weather permitting Absolutely Ice will be running a BBQ while the game takes place. Upon conclusion of the early face-off game the celebrations will continue at Copthorne Hotel, Slough with an evening of food, fun and partying. From 7pm players and supporters can sit together for a meal and take part in the shirt auction then enjoy a disco through the night and a chance to party with the players and other supporters. The occasion will be supporting two worthy charities, long term Slough Jets partner SPICE (Special People on Ice) and the Lymphoma Association. SPICE is a charity which makes skating and ice hockey accessible to those with additional needs from their Absolutely Ice base every Sunday morning. The Lymphoma Association supports people diagnosed with Lymphatic Cancer. On average 1 person is diagnosed every 40 minutes and association provides all kinds of support to those affected. For many years the Slough Jets have been the town’s premier sporting club, honours including London Cup, Heineken League Division 1, Southern Cup, British Division 1, Benson & Hedges Plate, British National League and most recently Premier Cup Winners and three times EPIHL Play-off Winners. In addition to the great success of the Slough Jets the Slough Junior Ice Hockey club also has won the Youth Development Club Of The Year. Jets founder and legend Gary Stefan and Jets last Head Coach Craig Moran will be calling on legends of Slough Ice Hockey to create two teams to battle out in an on ice spectacular. There will be plenty going on to accompany the game at the Arena providing a great afternoon of entertainment for the family. Tickets for the event are available in two formats or a combined ticket.